With more than a decade of experience in Vancouver, Yoshihiro Kawasaki is dedicated to Japanese garden design. He has fulfilled a dream to bring his cultural heritage abroad. He is very inspired by contemporary designs as well as the classical traditions. He graduated from Kyoto College of Art in this specialized field, where he learned theoretical and practical knowledge. Assignments took him to work in the four Imperial Gardens of Kyoto. 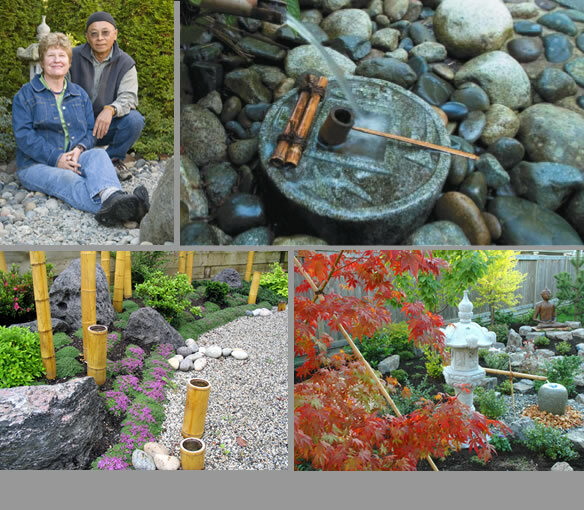 He worked in a team of Japanese landscapers before immigrating to Canada in 1997, when he and his wife & business partner, Dorothy Kennedy established 'Zen Gardens'. Dorothy brings along her unique creativeness and passion to each project. She also handles business developments and follow up to provide complete customer satisfaction. They take time to select quality plants, choosing hardy and more drought tolerant shrubs & trees as the climate changes. Sensitivity to ecology ensures the use of indigenous shrubs whenever practical, as well as the use of Pacific Northwest basalt & brohm for hardscaping. Each rock is artistically chosen by Yoshi. Commitment to his craft and dedication to perfection, his work has been recognized with awards and publications over the past decade. Besides his teaching certificate from the Ohara School of Ikebana , he is also a western style floral designer.